Director Jim Brown has created some of the most popular and critically acclaimed programs on American music in the last three decades, including The Power of Song, Peter Paul & Mary: Carry It On, The Weavers: Wasn’t That a Time!, A Vision Shared: A Tribute to Woody Guthrie and Leadbelly, and the series, American Roots Music. Here, he discusses his latest project, Legends of Folk: The Village Scene, which celebrates the folk movement in Greenwich Village in the 1960s. The program features rare performances by Bob Dylan, Peter, Paul & Mary, Joan Baez, Judy Collins, The Mamas and the Papas, Neil Diamond and others. Legends of Folk: The Village Scene airs Tuesday, August 9 at 8 p.m. on THIRTEEN. Get the CD and DVD of the program here. Q: You’re known as a director of documentaries about the history of American music. What is your background and why have you been interested in bringing these biographies to light? A: I grew up outside of New York and was around 12 just as the Folk Revival went into full swing. I played guitar in a little jug band and later a rock-and-roll band and made frequent pilgrimages to Greenwich Village. Peter Torkelson, who lived in the Village (and became Peter Tork of the Monkees), was my guitar teacher. 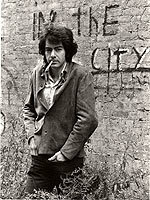 The poetry of the new singer-songwriters like Dylan, Paxton, Ochs, and Hardin blew me away as did the confluence of youth culture, political and social action, and “folk music.” I was lucky enough to see most of the artists that appear in Legends of Folk: The Village Scene as a fairly young kid. It was a special time and there was a strong feeling of optimism. As a teenager I worked as a gardener for Lee Hays after he moved to Croton where I lived. Lee was one of the founders of The Almanac Singers and The Weavers and was a close friend and song writing partner with Pete Seeger. I learned a lot just listening to Lee talk. I went to the film school at NYU (where I now teach) and began working at WNET right after college, making short films about pollution on the Hudson River for The Fifty-First State, one of the first magazine shows. For about five years I made documentaries that focused on social change and environmental issues with George Stoney who had been a teacher of mine at NYU. Around 1980 I directed The Weavers: Wasn’t That A Time! which was a hit and it opened a lot of doors. It played in theaters in several countries and then was used as a fundraiser on PBS for the next 15 years. (PBS renewed it this year). From the 80’s onward I mostly made documentaries about American music and also produced and directed live concerts for television. I got to work with a lot of great musicians and they have all influenced me…but Pete Seeger, who I have worked with the longest probably influenced me the most. I worked with some big record companies and some of the networks and cable stations…but by and large and happily mostly for Public Television. Q: Your films have focused primarily on folk music. What is it about this genre that speaks to you? A: The evolution of American folk music or American roots music is one of the great stories about American democracy. Various ethnic groups bought folk music from their homelands, and in America this music cross-fertilized and morphed into new and distinctly American music genres. It happened in a relatively short period and was stimulated in part by the advent of radio and records, but also by the development of railroads and highways. Gospel, Blues, Bluegrass, Cajun, and Zydeco are just some of the examples of these exciting cross-fertilizations that make up the basis of American folk music, and rock-and-roll which is an extension of the process. It’s all great music. Q: Legends of Folk focuses specifically on the music scene in Greenwich Village in the 1960’s…what was it about that time and place that made it the pinnacle of the folk music scene? A: Greenwich Village has often been a cauldron for alternative and artistic movements. Many of the abstract expressionists lived in the Village, there was an important jazz scene and the “Beat” all of which preceded the Folk Scene. In 1950, The Weavers started playing at the Village Vanguard and they were held over for six months. Some people consider this the start of the Folk Revival. In the 50’s, Village clubs featured singers like Josh White and later Odetta, Dave Van Ronk, The Clancy Brothers and the Kingston Trio. Pete Seeger and the ethnomusicologist Alan Lomax and the legendary record producer John Hammond lived in the Village. Pete got people singing in Washington Square in the fifties and by the sixties it became so big that the City had to close it down. Also, Oscar Brand had a regular folk show that was broadcast from Cooper Union. 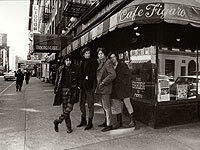 In the early 60’s, the folk scene in Greenwich Village really caught fire. I think the successes of Peter, Paul & Mary and Bob Dylan attracted a lot of young “folk singers,” fans, and tourists to the Village. On Sundays in Washington Square you could find dozens of musicians playing for free. There were bluegrass bands, jug bands, topical songwriters, old time music groups, acoustic “rockers,” doo wop groups, and even opera singers. It was splendid. Also there were dozens of coffee houses and clubs and some of them offered live folk and folk rock music from early afternoon till late at night. The Gaslight, Gerdes Folk City, The Night Owl, The Cafe Wha, The Cafe au Go Go, The Village Gate and the Bitter End all served as a training camp showcasing some of the country’s best folk artists and singer songwriters. The folk community was vibrant and small and mostly centered around the clubs on Bleecker and MacDougal Streets. Izzy Young’s Folklore Center sold songbooks and instruments and was a general clearing house for folksingers. Also, the Friends of Old Time Music were important in that they brought traditional blues and folk musicians up from the South and put on concerts with them. So, in a way, the younger musicians were influenced by the masters. There was also a dynamic political component and folk music and topical songwriting were intertwined with the Civil Rights Movement and the Peace Movement. It was a very exciting time and the Village produced some of the best and most important music America has ever witnessed. Q: What material was most difficult to edit out of Legends of Folk? A: Legends Of Folk: The Village Scene features 17 early performances by Bob Dylan, Peter, Paul & Mary, Simon and Garfunkel, Richie Havens, Judy Collins, Phil Ochs, The Lovin Spoonful, Tom Paxton, Don McLean, Tim Hardin, Neil DIamond, The Mamas and Papas and others. We worked with the artists and managers to find the best performances during this period and each is riveting in its own way. Watching these performances is like taking a time machine back to the Village in the 60’s. As a result, there isn’t room for lots of documentary material in the show and taking some of that out was a bit hard. The good news is that for someone who wants to learn more about the Village Scene in the 60’s there are over two hours of documentary material and complete interviews with the artists on the DVD. Time-Life has also worked with us putting together a special 6 CD set also titled “Legends of Folk: The Village Scene” that has some of the best music from that period for those people who really want to go back and revisit the 60’s. A: I am currently working on a project that summarizes the career of my friend Don McLean, who I first met at Lee Hays’ house back in Croton when I was a teenager. Don is best known for “American Pie,” but has written, recorded, and performed an incredible body of work. I think he is one of America’s best songwriters and an amazing performer. He just played for over 100,000 fans last month at a concert in the U.K. I am also finishing a documentary about the “soft power” of rock music and the role it played in ending the Cold War. It’s a joint effort between some creative people from the United States and some musicians and film makers in countries that used be part of the Soviet Union. Over the past few months I’ve been working with a team from Hollywood to transform some of the musical stories I came across doing documentaries into feature films. There is also talk of a follow-up to Legends of Folk: The Village Years focusing on the folk rock and singer-songwriter scene.